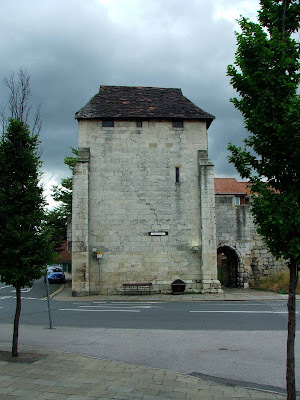 The tower over Fishergate Postern was built in 1501\02, and replaced an earlier tower, the Talkan Tower. 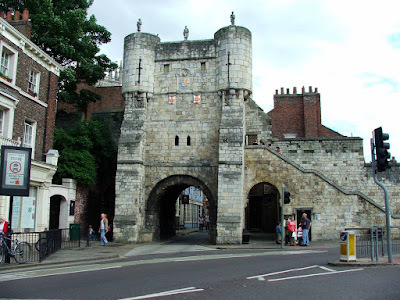 It was built to defend a new postern or gateway in the city wall here at Fishergate. Above. A view of the tower looking South. 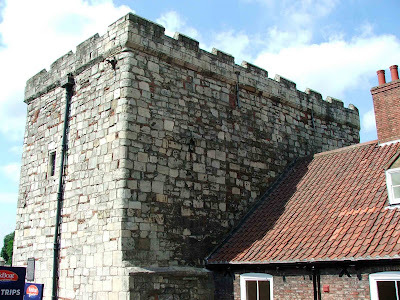 Fishergate is a tall rectangular tower of four storeys. It originally had a flat roof with crenellations. The steepled roof seems to have been in place for a significant period of time...John Speed's map of York, dated 1610, shows it pretty much as we see it today. Above. A view of the tower looking East. The postern can be seen to the right of the tower. The tower had a fireplace, now bricked up, on the first floor, and a spiral staircase in the South corner would have led up to a small turret on the former flat roof. Fishergate Tower can be found at the junctions of Tower Street, Piccadilly and Fishergate, and is only about a hundred yards East of the castle. 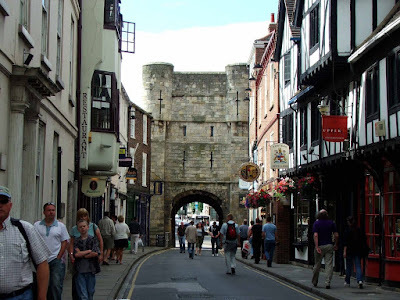 York is noteworthy in England as one of a tiny number of towns with two Norman built castles. 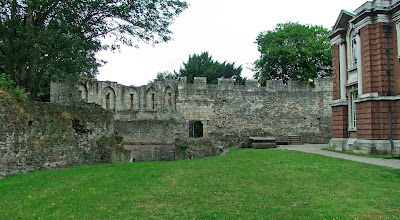 Cliffords Tower, the more recognisable and complete of the two, sits on the East banks of the River Ouse, sandwiched between Tower Street and The Castle, whilst the Old Baille sits hidden under a canopy of trees on the West banks of the River Ouse, at the junctions of Cromwell Road and Skeldergate. The Old Baille was built in 1068 by William the Conqueror, as part of an effort to bring the city under his control, and was the second castle to be built in York in two years. 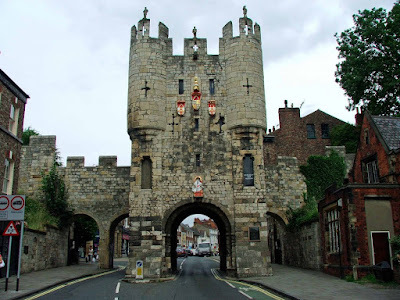 Both castles had been severely damaged, if not completely destroyed by 1069, by a Danish army intent on reclaiming the North of England back from William. Both castles were repaired almost immediately that the Danes had left (paid handsomely to quit England) and the English rebels defeated. The motte stood to a height of around forty feet and had a diameter of around one hundred and eighty feet at the base. Today it stands to around twenty five to thirty feet in height. 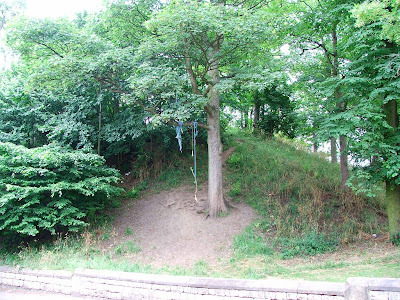 Investigations of the motte in 1969, found evidence that it had been constructed in horizontal layers of earth and stone, and during the 1300's, it was topped with a timber structure with a wooden palisade around the summit. 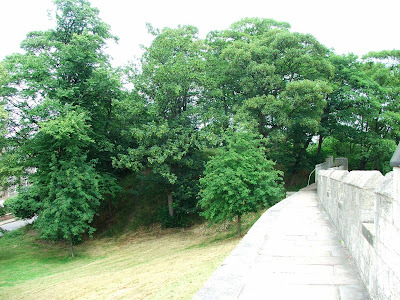 It is thought that a flight of steps led to the top of the motte, and that it was protected by a deep and wide ditch. The Old Baille had a rectangular bailey area to the North West, probably where the houses on Falkland Street and Baille Terrace now stand. The bailey was surrounded by a bank and ditch, and probably covered an area of around three acres. The Old Baille was probably out of use by about 1200, and had been handed over to the Archbishop. Around 1322, Archbishop Melton gave promises to defend the Old Baille if the city would offer up assistance in times of war. He rebuilt the defences of the castle, firstly in wood, and sometime later, in stone. Responsibility for the upkeep of this castle, especially about who was to pay for repairs etc, rumbled on until the middle of the 15th century, when the city of York obtained ownership of the motte and its bailey. From this time on, the castle area was used for grazing cattle, and only returned to a defensive mode of use when two cannon were mounted on its summit during the civil war. 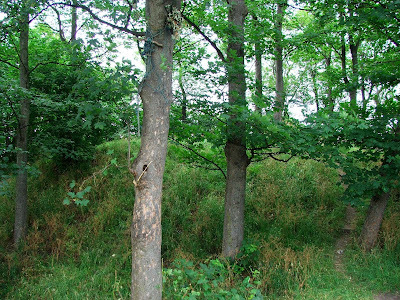 With the restoration of the monarchy, the castle was once again returned to grazing, and in 1722 the summit of the motte was lowered and planted with trees. Between 1807 and 1807 a prison was built over the bailey area. The prison was closed in 1868 and then demolished in 1880. The bailey area was then built over with houses and streets occupying the site. These days the motte has become part of the wall walk, and is easily accessible after crossing Bishopgate Bridge and heading West along the A1036. The above link details an excavation of the motte in the late 1960's. Interesting reading! 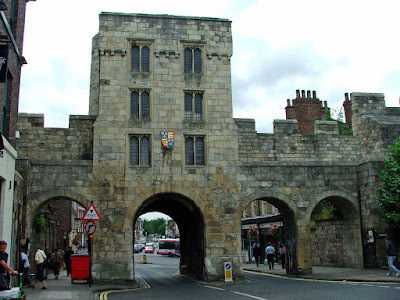 Bootham Bar gatehouse stands on the site of the old Roman entrance into the city of York, The Porta Principalis . It contains some of the oldest stone work in the city walls complex, some of the building dating to the 11th century. The gateway was rebuilt extensively in the 14th century, and again during the 19th century, although, as stated before, much of the original stone work is incorporated into the body of the structure. The pepper pot turrets at the top of the gatehouse were added during the 1800's and are therefore not part of the original structure. The gatehouse sits at the junction of Gillygate, Clifton (A59) and High Peter Gate, and acts as a passage way through the city walls. It had a portcullis originally, which can still be seen raised up into the ceiling. 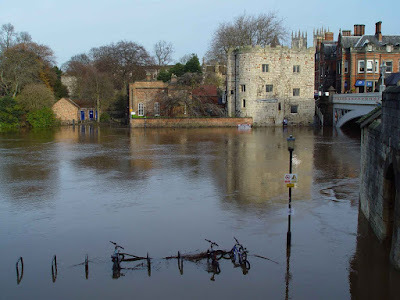 Barker and Lendal Towers, sit either side of Lendal Bridge over the River Ouse. The bridge links Station Road with Museum Street, and was built in 1863 by Thomas Page. Before the bridge was built, the river was cross using a ferry. 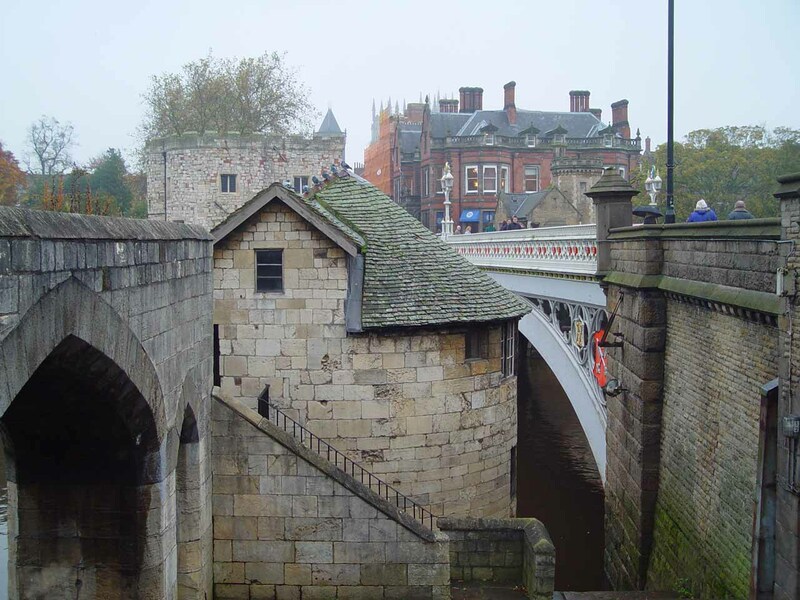 The towers would have been used to defend the gap in the city's walls that the river created, and to offer a point at which tolls could be collected for goods being shipped in and out of the city. 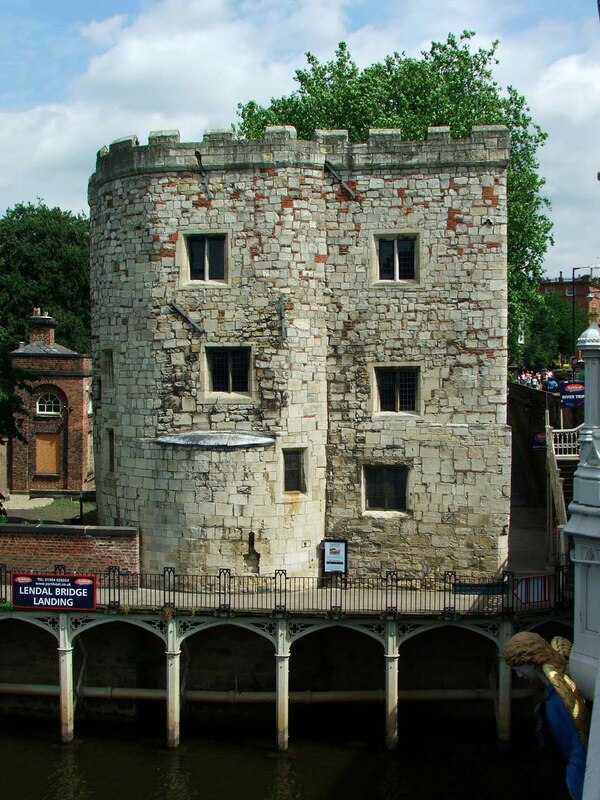 Lendal Tower lays on the North banks of the River Ouse and if first mentioned in historical documents in 1315, as the 'turrim Sancti Leonardi'. At this time, the tower was circular with a staircase turret on one side. 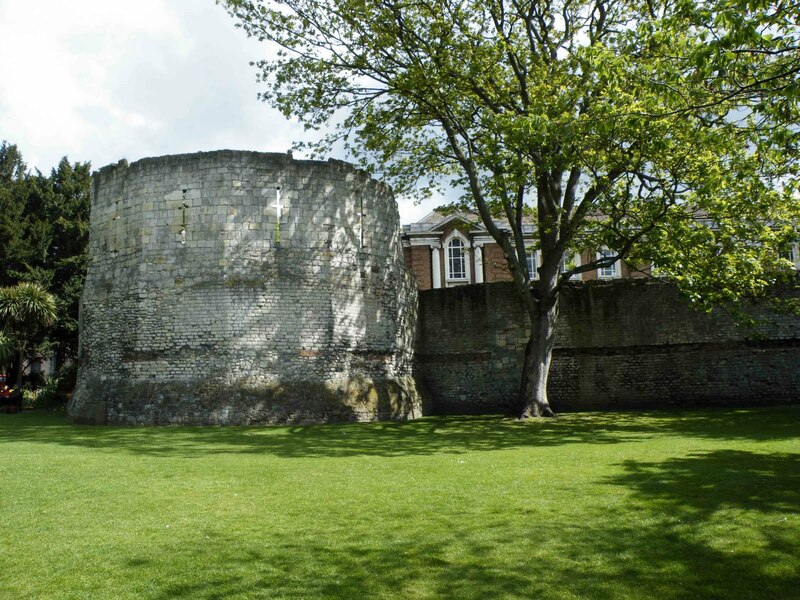 The tower was described as 'a great tower with a chain of iron to cast over the Ouse' referring of course to the chain that would have been strung between Lendal Tower and Barker Tower on the opposite banks. The keepers of this chain, are named, in documents dating from 1380, as John de Poynton at Barker Tower, and Thomas Smyth at St Leornards, or as we know it, Lendal Tower. Above. A view of Lendal tower on the banks of the flooded River Ouse. The tower has been altered over the years, so that it does not now display its circular form. 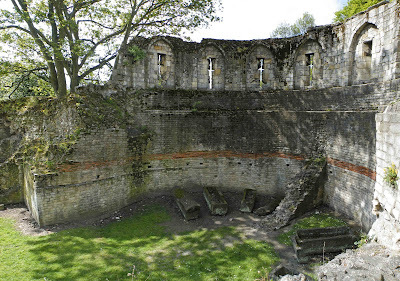 Only on the river side of the walls, can the round walls be seen. It was repaired in 1584 and 1585, and had its roof replaced in 1598. Above. A view of the rear of Lendal Tower. 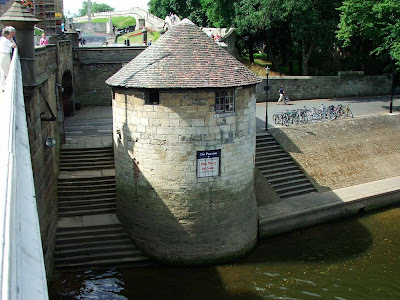 A proposal was put forward in 1616, to use the tower to house machinery to provide the city with fresh water from the river, but it wasn't until 1674 this scheme was actually undertaken. The tower was rented out on a lease of 500 years, repaired and raised to house the machinery. A pump was inserted into the tower, powered by a water wheel. This was later replaced by a wheel powered by a horse. Above. 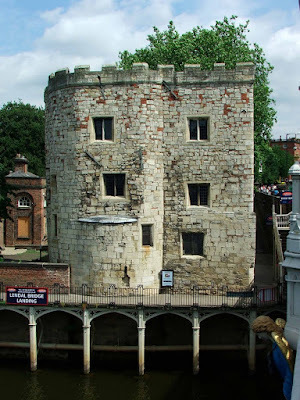 A view of Lendal Tower above the River Ouse. Drawings and sketches dating to before 1846, show the tower at its post 1674 height, whilst later sketches, dated to after the 1850's, show the tower much as we see today, slightly reduced in height, sometimes partially submerged beneath the swollen waters of the Ouse. The Barker Tower lies on the South banks of the Ouse, and would have been used to secure the other end of the chain across the river. This tower, like Lendal Tower, served both a defensive and a commercial use. Above. Barker Tower from the bridge. 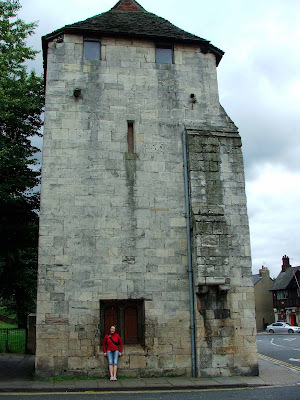 This tiny river side tower is first mentioned in records dating from 1380. From early sketches and drawings, it is evident that the Barker tower hasn't changed much over the years. The most visible difference is the inclusion of windows just beneath the eaves of the roof. These windows were originally the tower's crenellations. Above. Barker Tower viewed between the walls and the bridge. Up until about 1863, the tower was traditionally let to the Ouse ferrymen, who were responsible for ferrying men and goods between the North and South river banks here.